KAZAN, March 22. /TASS/. Russia won’t have to redesign the wing of the MC-21 airliner after the substitution of US composite materials by domestic components, Deputy Prime Minister Yuri Borisov said on Friday. "Necessary measures have been taken so that we can substitute all imported [composite] materials and produce domestic final samples, which have already confirmed their basic characteristics and this allows us to expect, and we are already convinced in this, that the redesigning of the wing won’t be required," the vice-premier said after his visit to the Alabuga special economic zone in the Volga area. It is not a secret for anyone that the US suppliers have refused to supply materials to Russia for the production of the MC-21 airliner’s composite wing," Borisov said. "But this has not impaired our wish and possibilities to complete this project on time," the vice-premier stressed. Russia expects to complete the certification of the MC-21 airliner in 2020 and arrange its serial production from 2021, the vice-premier said. "We expect that the plane will remain competitive in 2021. If we succeed doing everything on time, it [the airliner] will have a happy life in accordance with our plans," the vice-premier said. As was reported earlier, the Aerocomposit enterprise, the supplier of Russia’s United Aircraft Corporation (UAC), has been slapped with US sanctions and the deliveries of components made of composite materials for creating the MC-21’s wing have been halted. The project of creating the airliner will be implemented using the composite wing made of domestic components, UAC President Yuri Slyusar said earlier. In January, the office of Deputy Prime Minister Borisov reported that the government was controlling the situation and the program would be carried through. The UAC said at the time that it had already launched a procedure to appeal against placing Aerocomposit into the sanctions list as this was a fully civilian company. The vice-premier’s office estimated extra investment in the creation of the composite wing at 2.7 billion rubles ($42 million). The MC-21 is a medium-haul passenger jet being developed by the United Aircraft Corporation. 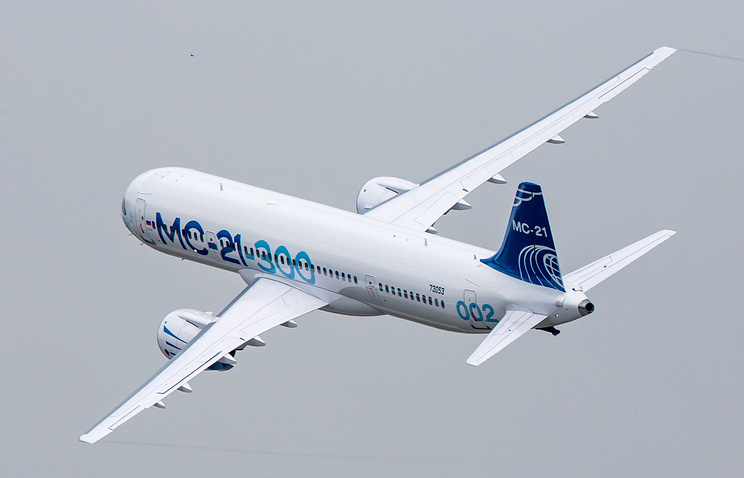 It may come in two configurations - the MC-21-200 (seating 132 to 165 passengers) and the MC-21-300 (163 to 211). Another configuration, the MC-21-400 with up to 250 seats, is also planned. Currently, only the MC-21-300 plane is being developed. It performed its first flight at the end of May 2017.